carved fully in the round, the deified guardian warrior shown with a menacing expression, his mouth open as if to speak, baring his teeth, his large round eyes bulging under ridged brows knotted in a scowl, the hair pulled up into a topknot behind a small diadem, and the ears fully detailed, the surface of the fine white stone with flecks of mica throughout and smoothly polished overall, now mounted on a pedestal base veneered in patinated bronze. Compare the Tang dynasty stone head of a guardian from the Buddhist cave temples at Longmen in Henan province which was included in a 1995 special exhibition at the Osaka Municipal Museum of Art, illustrated in the catalogue, Chinese Buddhist Stone Sculpture: Veneration of the Sublime, Osaka, 1995, no. 59, p. 63, with full description on p. 141. 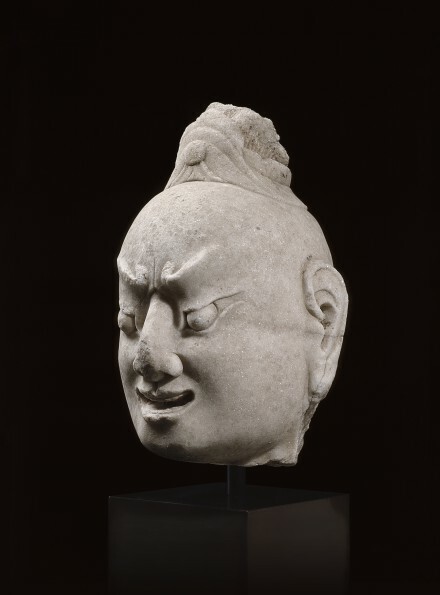 Compare also the Tang dynasty stone figure of a guardian from the von der Heydt collection now in the Museum Rietberg, Zurich, and illustrated by Schlombs et. al., in the catalogue of special exhibition The Heart of Enlightenment: Buddhist Art in China 550-600, Cologne, 2009, pp. 110-113, no. 21.